September 16th in Wordpress Training by Wordpress Jedi . I had a chance to review Lynda.com’s WordPress 2.5 training software a couple of weeks ago, and I must say, it took a lot out of me to get to the finish line. 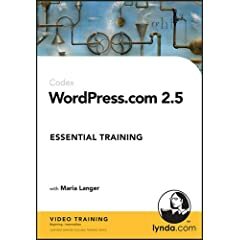 I got to say that I am a big fan of Lynda.com DVD training series. I have learned Flash and Illustrator from Lynda.com folks, and for that I’d be always grateful. But I was skeptic about this training DVD set when it came out. It is not a very expensive DVD set, but I was wondering how they would approach WordPress through video clips when it needs so much hands on practice. As you can guess from the table of contents, the WordPress 2.5 Essential Training is not for advanced WordPress users. You don’t learn how to write a theme from scratch or how to modify the code behind plugins. But you will learn basic to intermediate WordPress techniques that help you become a better blogger. I think for $49.95, this is a great set for people who have never worked with WordPress before (or haven’t blogged before for that matter). One thing is for sure though. DVD sets sure can make you lazy. You don’t even have to read books anymore as you can just listen and watch a trainer do things in front of you. Now if you are sharp enough and are not checking ESPN news at the same time you are going through these DVDs, there is a good chance you will pick up all you need to know to get started with WordPress. But best of all, you can get it all done in about 6 hours (counting 2 30 minute breaks). That surely beats going to a conference and paying a $1000 to learn the same stuff, doesn’t it?